But boy, could it multitask. 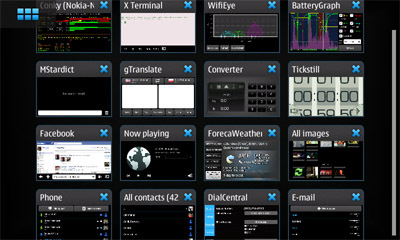 Sixteen apps running simultaneously on the N900’s task management screen. And sixteen is just the most you can show without scrolling. Like a PC, there is no upper limit except available memory. Two years ago Nokia’s future was going to be Maemo, a cutting-edge operating system based on Linux with a sleek interface to replace the veteran Symbian OS. The phone that would bring it was the N900. This had the same processor as the rival iPhone 3GS, plus a much better screen and camera, neat slide-out keyboard, a kickstand and great stereo speakers for watching video, and even features the iPhone lacks to this day like real multitasking and a memory card slot. As Nokia had been and was still the leading maker of smartphones, you might imagine a pent-up market of loyal customers gagging for a device that would show that upstart Apple. Yet when it arrived they stayed away in droves. The N900, very arguably the most advanced and capable phone yet made, was a magnificent, absolute, utter market failure. What the hell went wrong? More than one thing, clearly. A phone with that much going for it could surely have survived one weakness, maybe even two or three, and still gone on to be a big seller. Four though is pushing it. The other week I showed it to an iPhone-using friend. She was interested, but asked – quite innocently – “Why is it so thick?” It’s true, it’s as thick as a brick. Downright chubby. Though its other dimensions are almost identical to the iPhone 3GS, it’s half again as deep. Is that such a bad thing? Thickness is actually a practical advantage in a phone, there’s little chance of cracking this one in your pocket. But such arguments weigh little in the scales of fashion. People have to be slim, therefore our phones have to be slim too – that seems to be about all the logic there is to it. An even more damaging shortfall though was the strange absence of multitouch. Perhaps Nokia had too little experience with the necessary screen technology, but launching the N900 without a modern interface was like naming a ship “Abandon”. A resistive screen with a stylus for tapping little icons was an interface from obsolescent Windows Mobile and historic Palm devices. Nobody wanted one now. Nobody, except a few freaks such as myself. Resistive is far better suited to drawing than the capacitive type of screen used for multitouch. Capacitive requires a large contact area with the surface, making precise detail impossible. 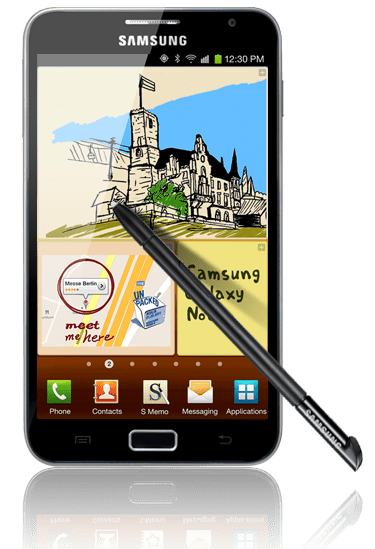 Plus it lacks any dimension of pressure sensitivity, while resistive screens can be highly responsive to changes in the pen press. Combined with pressure-aware Linux drawing applications like MyPaint, this ‘outdated’ resistive interface allowed realistic pen-like or brush-like drawing strokes. This made the N900 the best phone ever created for art,¹ a powerful but sensitive digital sketchbook you could carry in a pocket. Many of the cartoons appearing on this blog were done with it – pencilled, inked, coloured, lettered and uploaded without ever seeing paper or PC. You can even edit images with GIMP, a program with capabilities comparable to the full desktop version of Adobe Photoshop. But the very thing that most endeared it to me was a huge turn-off to the wider public. Then there was the lack of apps. As Apple were first to realise, shopping is part of the experience now. A phone is nothing without stuff you can buy for it. There are some very good apps available for Maemo – but almost none to buy. Its Open Source Software roots meant that people were keen to contribute useful stuff. With a little tweaking it could even run apps built for desktop Linux. But that actually worked against a market for the Maemo platform. Professional app developers were discouraged by having to compete with free. And this cultural clash, Open Source on one hand and commerce on the other, created other unforeseen problems. If you’ve got an issue with a community-developed program, to whom do you complain? You don’t. In the cooperative world of OSS you file a bug report, documenting the issue and the circumstances that produce it. Which is lovely, but customers who’ve paid money for a fancy phone hardly expect to have to help out as well. Nor do they expect tech support that tells them to open a terminal window and enter Linux commands. That isn’t actually as intimidating as it might sound, but “Buy this and soon you’ll be learning Linux” is not the sort of slogan that say Apple would use. Or indeed anyone who wanted to sell anything. And yet… It was so damn promising. If they had moved quicker to smooth off the edges of Maemo, if something like the N9 had arrived a year earlier – while people were still actually waiting for it – it might have been a hit instead of a peculiar footnote². Instead, Nokia paid brutally for not getting their collective arse in gear. But, it was a remarkable achievement and a fascinating experiment. Even when it’s no longer my primary phone I’ll keep the N900 around, especially for travel, as an incredibly miniaturised PC. They can be picked up new on Ebay for under $200 now, I recommend them highly. 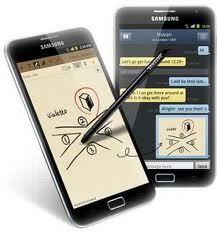 Though Samsung were later to make the impossible dream come true by putting an actual Wacom digitizer on a phone. A footnote to the footnote: There are rumours that Nokia have quietly continued their Linux-based development – just not for smartphones. Dubbed Meltemi, a descendent of Maemo is rumoured to be the future replacement for the S40 “dumbphone” system that has done so well for them for so long, and could be used to bring smartphone-like features to low-cost devices. That might prove competitive against the rising tide of (frequently awful) cut-price Androids. A sad end for the noble Maemo maybe, but it could save Nokia’s bacon – and of course make them less dependent on Microsoft. Who’s to say that a Linux smartphone will not rise again?